Viega Counter Day at Betz Lester Location! 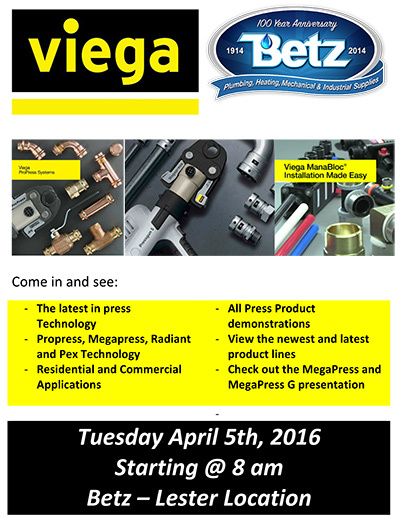 On Tuesday April 5 starting at 8am, WM Betz will be hosting Viega Counter day at our Lester location! Come in and see: The latest in Press Technology; Propress, Megapress, Radiant and Pex Technology; Residential & Commercial Applications; All Press Product Demonstrations; View the newest and latest product lines; and Check out the MegaPress and MegaPress G Presentation. Welcome to our new website! Our previous website was several years old and needed to be revamped to provide our visitors with a better experience. Among the numerous changes that we made was to make our website “Mobile Friendly” for our visitors who prefer to visit us from their phone or tablet. In addition, you will see that the overall design of the site has been enhanced, with a more visually pleasing look and feel, and the addition of more pertinent content. We hope that you like our new website and find it useful. And should you have any questions or need any help at all, please feel free to contact us and we will get you the answers that you need. Thank you for visiting the new online home of WM Betz Plumbing and Heating Supply! WM Betz Celebrates 100 Year Anniversary! 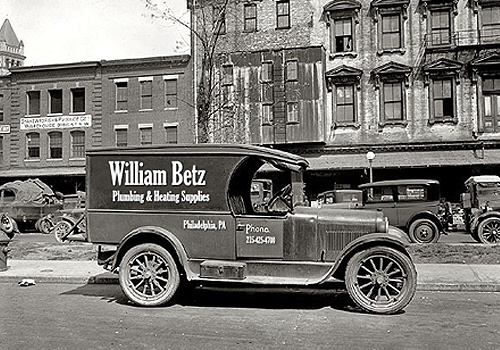 WM Betz was founded in 1914 as a family run plumbing and heating supply business. 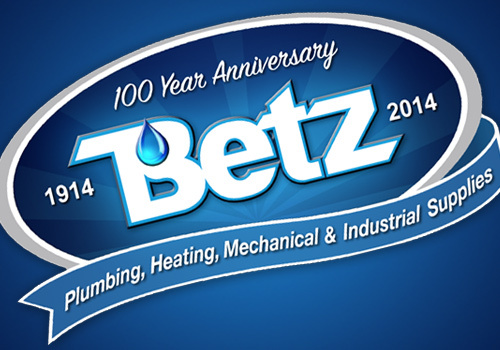 In 2014, WM Betz celebrated 100 years in business making it one of the oldest Plumbing, Heating Supply companies in the country. Our motto has always been to “provide prompt and courteous service”, which has helped us to retain a loyal customer base through the years. In 1996 we opened our Lester branch, followed by the opening of our Northeast Philadelphia branch in 2006. As a company, we are always looking for ways to better serve our customers in every aspect of the industry. Opening these other branches has given us a broader sense of serving other metropolitan areas throughout Philadelphia and South Jersey. The future looks very bright and WM Betz is looking forward to the next 100 years with great excitement. We want to thank all of our customers who have helped us along the way and we look forward to continuing to provide exceptional products and service to help make your projects a success!